For the past few weeks I’ve been working on a research paper that analyzed representations of fat bodies, gender, and sexuality in the television series Huge for my Gender and Film class (I made an ‘A’. Hot damn!). Although the paper has been turned in now, some of the scenes from the series have remained in my mind. There’s one particular scene that really struck me as to how I have felt many times since joining a circle of bloggers who are body-acceptance and fat-acceptance. 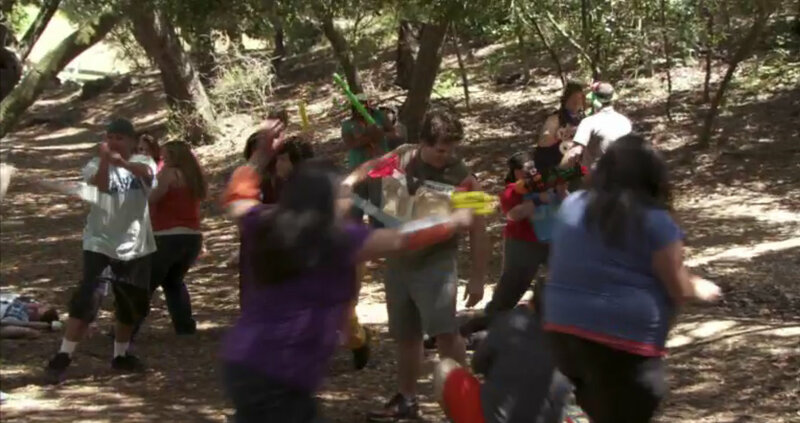 In the episode, the campers are LARPing (Live Action Role Play) in the woods, and they are completely letting themselves be part of the moment. They’ve left behind the “I’m too cools” and “But that’s geekys” and are just taking the moment at hand and being joyous in it. They feel safe and free to be themselves, but to also act outside of themselves through their LARP characters, which just shows how comfortable they really are. Basically, there are all these amazing fat people out in the woods having the times of their lives. Campers too busy having tons of fun for me to get a great still-shot of them LARPing. 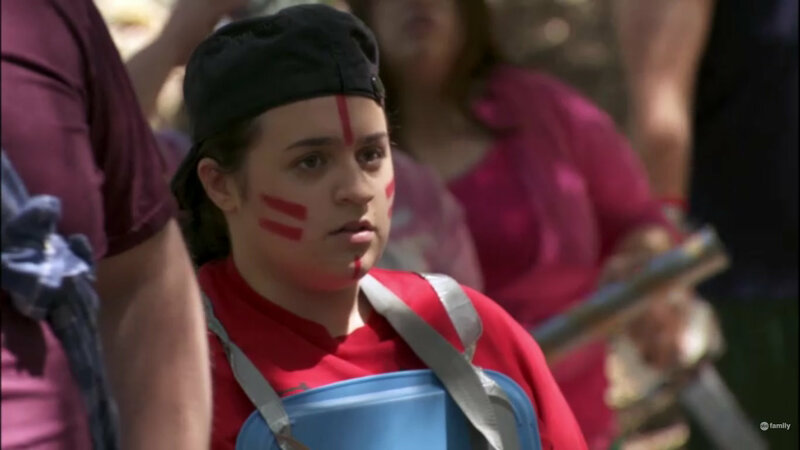 The Tormentors then invade the LARPing space, making fun of all the campers for being fat, drawing the campers attention back to the sad “reality” that they are fat and should not be able to enjoy life/feel good about themselves, etc. The Tormentors laughing at the campers… plus the character of Amber trying to “pass” as a tennis camper. I’ve been at this intersection of realities much too often. Where I interact in positive spaces, and then I’m forced to face people or institutions that are negative about my body. This week on twitter, a trending topic came up for #fatpeoplenightmares. I saw someone I follow retweet a few poignant tweets from someone who was saying things about REAL nightmares for fat people, such as denial of health insurance, so I clicked on the link thinking it’d be tweets from actual fat people, but it wasn’t. Instead it was a lot of fat hatred and witless humor about the apocalyptic nightmare of fast food withdrawals. I had it right there in my face, and my reality smashed with the “reality” of these fat haters. I had a moment of weakness: a moment of thinking that how I’ve been thinking and writing won’t make a difference because of all of these hateful people. The character of Will facing a collision of realities. But then I had to remind myself of one very important thing. That I was lucky enough to be playing in the metaphorical woods with a bunch of wonderful fat people. In the episode, the campers rally against the Tormentors, and all join in a battle cry of victory. While the fat supporters weren’t able to fully silence the fat haters on Twitter, I was still able to see our victory in addressing that we rejected the message of those tweets, and then going back to our usual business of body-positivity. Not letting them interfere in how we want to live our lives, how we want to create our “realities” in a body-positive space, is special. And I feel lucky that when I have to meet the occasional internet troll these days, I get to go back and talk with people who aren’t that way and would never be that way towards others. I get to go back to my reality where I choose to be surrounded by you all. I loved Huge so very much and love that you took me back to how wonderful it felt to watch it. 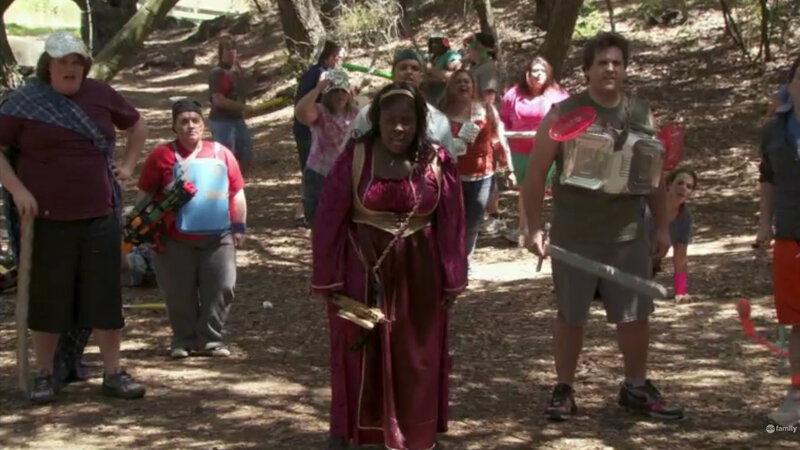 There was so much joy in the larping scene. Man, I love those people!! My reality is just that. Mine. When I intersect with others whose reality is different it doesn’t all of a sudden deny my truth. It’s just like you said. A collision. Coming out of it unscathed and going on my with same as usual life isn’t a challenge. Body positivity is always going to win over body hate. Such a thoughtful post, Rebecca! Congrats on the A grade! That trending topic on Twitter upset me mainly because I see it as a form of bullying – completely unacceptable. The world is unfortunately full of cruelty but we can’t let that interfere with our well-being. (Easier said than done when a person is young though!). But that’s one of the things I love about your blog. You are among the bloggers who make the world a better place by helping young women (and some not so young, like me!) express themselves, as well as inspiring others with your fabulous dress sense and style! 🙂 Thank you.